A 20-year commitment to cancer survival. The National Coalition for Cancer Survivorship (NCCS) honored Medical Minds at their 25th Anniversary “Rays of Hope” Gala for our long-term commitment to producing the award-winning Cancer Survival Toolbox®. This program is a gold standard in patient self-advocacy and has been accessed by almost one million cancer survivors to date. It’s a free resource for cancer survivors and their loved ones that has the power to transform lives by providing both the tools to overcome fear and the inspiration to embrace survival. In the late 1990s, the Medical Minds team worked at the agency of record leading prelaunch and launch activities associated with Rituxan®. At that time, Genentech was new to oncology, and the Cancer Survival Toolbox was a flagship program that demonstrated the company’s leadership and commitment in this important arena. Following the first 5 years of dedicated unrestricted grants from Genentech, almost every oncology pharma company has also supported the program through unrestricted grants. 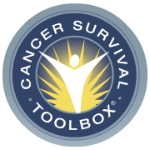 Medical Minds continues to update and manage the Cancer Survival Toolbox for NCCS. A group of dedicated oncology nurses and social workers from leading advocacy groups provides initial content, and our team designs, scripts, records, and produces the program.